On Monday, a solar eclipse will reach totality across the US for the first time in 99 years, truly making it the occasion of a lifetime. But if you're a parent with squirmy little children, you might be concerned about watching the eclipse safely. Some people have been planning their eclipse-viewing for months. But, if that's not you, don't worry. You've still got some time to prepare. 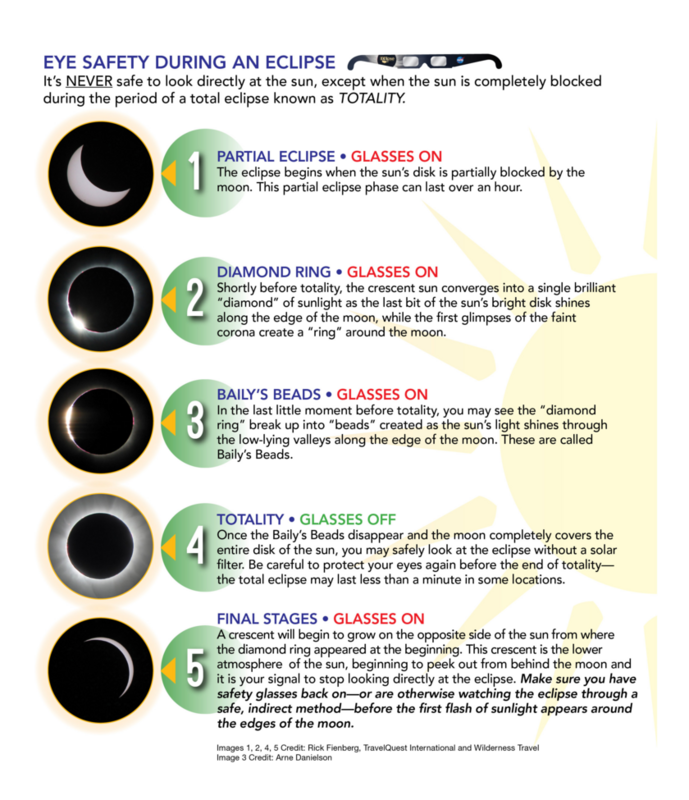 Before you head out to your eclipse watching party, check out these last-minute safety tips to protect the eyes of your little ones (and yourself!). Just like on any other day, staring directly at the sun is a bad idea. That's why your first step should be grabbing a pair of safety glasses. If you've been on the prowl for glasses in the past few days, you've probably noticed they're sold out almost everywhere. Never fear! Here is a list of locations giving away glasses for free (try your local library, astronomical society, public health department, or even local eyewear stores). There are lots of imitation glasses on the market, so don't be fooled by knock-offs. You want to buy a pair of solar-filtering glasses from any of the vendors found on the American Astronomical Society's website. It's also important to make sure that your glasses don't have scratches or scuffs, even if they are brand new, as that can hinder their abiltity to protect you. Oh, and do not try to use old 3-D glasses -- they're ﻿not﻿ the same, and they won't be very helpful here. If you want to make sure your glasses are the real deal, check out this handy graphic. APO (American Paper Optics) certified glasses are the way to go. And real APO glasses have a more narrow ear hook and more circular lenses. They also should have a full set of instructions written on the inside of the frames. More from CafeMom: Experts Warn These Viral Baby Neck Floats Are Actually 'Potential Death Traps"
Though it's not recommended for young kids, there is a way to look at the eclipse without eye protection. You should be wearing your solar-filtering glasses the entire time you are watching the eclipse, but if you are in the line of totality you can take your glasses off for the brief moment when the moon completely blocks the sun. Then quickly put your glasses back on to finish watching. If you only have a partial view of the eclipse, you should never remove your glasses. If you can't find glasses anywhere, a pinhole projector is a quick and inexpensive second option for safe viewing. As explained in the video above, all you need to make a pinhole projector is a thumbtack and two large index cards. Carefully make a hole with your thumbtack in one of the index cards. Then turn away from the sun and look for your shadow. Holding the index card with the hole, bend your arm so the card and your shoulder are touching, and then with your other hand, place the second index card in the first card's shadow. The eclipse can be seen through the hole you made in the first index card, and you'll be able to see the whole thing safely without glasses. -After watching the eclipse, turn away from the sun first before removing your glasses. Do not remove your glasses while still facing the sun. -Do not look at the eclipse through unfiltered lenses -- including cameras or telescopes. -If you normally wear glasses, keep them on and put your eclipse glasses on top of them. You can view their full list of additional tips here. The absolute safest way to watch the eclipse is through a live-stream on the Internet, but if you want to watch this momentous event live with the whole family (who wouldn't? ), make sure you take these easy safety steps!